My company had a fancy-shmancy lunch at Tony and Joe’s Seafood Place recently. Nice place, I suppose, except for the fact of the waiter telling me that they don’t really cater to vegetarians. He proved it by bringing me a baked potato with bacon. I guess honesty is worth something in this day and age. The best part was the classy trough-style urinal. It really brought back memories of the ballpark, highway rest stop, “out-back” facilities in Thailand and many more. 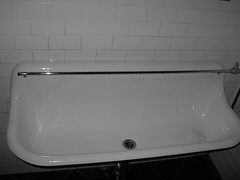 Have you seen one of these old troughs still in operation anywhere recently? Extra points if you link to a photo. Don’t go for the food or service, but definitely go for a beer and to check out this relic of a by-gone age.